Recently, I gave a talk at The Book Club of California titled Beyond the Spine: A Closer Look at the Book Designs of W.A. Dwiggins for Alfred A. Knopf. While preparing the talk a few months ago, Jennifer Sime, the executive director of the club, asked me if I could prepare an article on short notice for the club’s quarterly newsletter. I jumped at the offer because it gave me an opportunity to write in depth about the colophons in the books that Dwiggins designed for Knopf and to trim my talk. The Quarterly News-Letter text was beautifully typeset and printed by Richard Seibert, using MvB Verdigris by Mark van Bronkhorst. (I think Dwiggins would have been pleased with both the typeface and the close setting.) Unfortunately, only the members of The Book Club of California get the newsletter. Ms. Sime and The Book Club of California have graciously allowed me to republish my text here so that those who are not members of the club can now read it. This is also a chance to to supplement it with some illustrations of several colophons. The publishing house of Alfred A. Knopf has long been celebrated for the quality of its books. 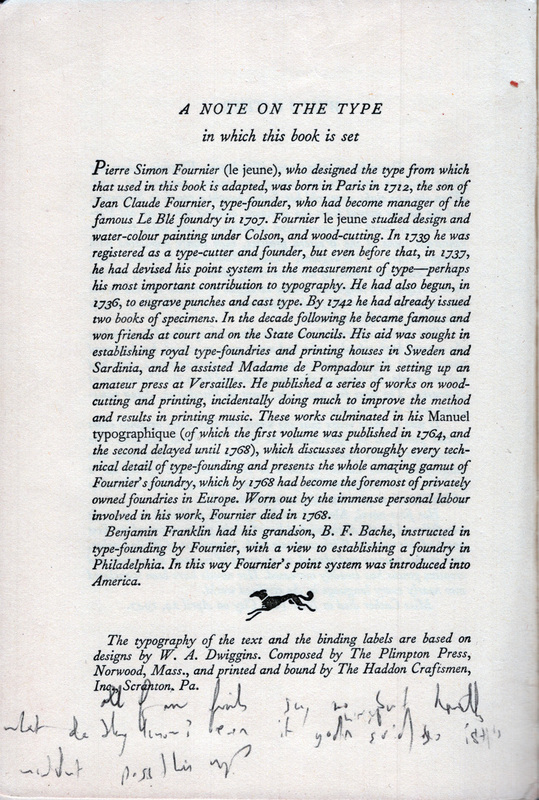 This reputation has been based as much on the presence of a colophon in each of the company’s books as on their literary merit, binding, design, and typography. When Knopf began his business in 1915, colophons were associated with limited edition books of the Arts & Crafts movement. His appropriation of the colophon gave his trade books the cachet of the fine press book, an aura that his competitors lacked. When did Knopf add the colophon to his books and what was the impetus? How did the colophon become entwined with the book designs that W.A. Dwiggins did for the publisher? And how and why did the content of the colophon change over time, even beyond the death of Dwiggins? These are the questions that I will attempt to answer in this essay. The earliest Knopf books had no colophon, only a bare bones statement at the bottom of the copyright page: “Printed in the United States of America.” In early 1922 that text was suddenly expanded to a full-fledge production note. The one that appeared in The Dark Fleece by Joseph Hergesheimer (published in March, 1922) read: “Set up, electrotyped, and printed by the Vail-Ballou Co., Binghamton, N.Y. Paper supplied by W.F. Etherington & Co., New York, N.Y. Bound by the Plimpton Press, Norwood, Mass.” This wording – with changes for different printers, paper suppliers, and binders – remained standard for several years. But at the same time Knopf was trying to capitalize on the burgeoning trend in the United States toward collecting limited edition books, especially those signed by the author. On September 8, 1922 Knopf published One of Ours by Willa Cather, an author who was to become one of the firm’s mainstays over the following decades. The verso of the title page of the first printing indicated that it was limited to thirty-five copies “on Imperial Japan Vellum and three hundred and ten copies on Perusia handmade Italian paper, numbered and signed by the author.” Four more unlimited printings followed later that month. This may be the first colophon in a Knopf book. Oddly enough, it makes no mention of the designer/typographer or the printer. Knopf expanded his foray into the world of limited edition, signed books in 1923 with the publication of Ralph Herne by W.H. Hudson and the reissue of April Twilight and Other Poems by Cather. Ralph Herne was designed by Bruce Rogers and printed by William Edwin Rudge while April Twilight was overseen by Elmer Adler of Pynson Printers. The following year the publisher issued Edmund Burke: A Historical Study by John Morley (designed by Rogers and printed by Rudge) and Ornaments in Jade by Arthur Machen (designed by T.M. Cleland and printed by Pynson Printers). These books had full-fledged colophons as opposed to production notes. They appeared at the back of the book, credited individuals as well as companies, and included information on the print run. At some point between 1922 and 1926 Knopf extended the use of colophons from his limited edition books to his trade books, but the exact history of this development is sketchy. Over the years the trade book colophon came to be known for its emphasis on type above all other design and production aspects. Clifton Fadiman, in the introduction to Fifty Years (1965), a collection of short stories celebrating the silver anniversary of Alfred A. Knopf, says that “A Note on the Type in Which This Book Is Set” was introduced in 1926. But at that time, Knopf trade book colophons carried no headings and did little more than identify the types used. This book is set in a type called Scotch. There is a divergence of opinion regarding the origin of this face, some authorities holding that it was first cut by Alexander Wilson & Son of Glasgow in 1833. Whatever its origin, it is certain that the type was widely used in Scotland where it was called Modern Roman, and since its introduction into America has been known as Scotch. The format, decorations, and illustrations were made by W.A. 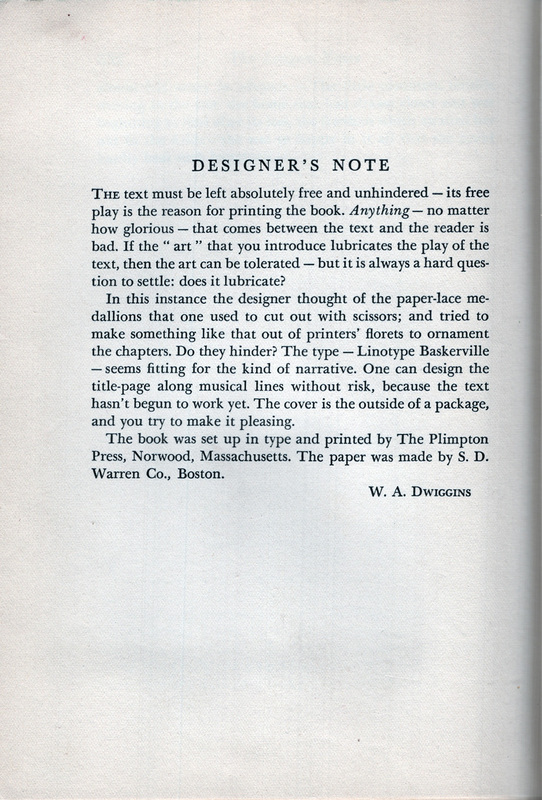 Dwiggins and the book manufactured under the auspices of the Pynson Printers of New York. The press work and binding was done by the Plimpton Press, Norwood, Mass., and the paper made by the H.C. Chalfant Mill. “Years ago, when the Linotype Company took type seriously,” Frank Denman wrote to Alfred A. Knopf in 1952, “I used to do a lot of typographic writing for it. During that time, at the request of Bob Josephy, I wrote the series of typographic notes you use in your books.”  His claim is credible. In 1926, Denman – best known today as the author of The Shaping of Our Alphabet (New York: Alfred A. Knopf, 1955) – worked in the advertising department at Mergenthaler Linotype where he was considered a “rising young publicity engineer.” The verbosity of the early typographic colophons certainly suggests their author was someone in the type trade rather than someone in the publishing trade. The earliest securely dated book in which I have found “A Note on the Type in Which This Book Is Set” is Death Comes to the Archbishop (1927) by Cather, for which Dwiggins designed the binding labels. The description of the typeface – Fournier, which was newly released from the Monotype Corporation – runs to over sixteen hundred words while the production information takes up less than two hundred words. Many of the early typographic colophons are shaped, such as the one for The Wild Orchid (1931) by Sigrid Undset, which is in the form of a diamond. Colophon for The Wild Orchid by Sigrid Undset (New York: Alfred A. Knopf, Inc., 1931). –Mr. —— thinks it helps to tell them about type and paper, etc. –I know. It doesn’t. They don’t understand his little notices—it’s all shop talk. He likes ’em. He thinks it gives the books tone, I daresay. I think it doesn’t matter a damn one way or the other. All that shop detail is zero. They don’t care to know and they don’t need to know. Just make your book so it will read handily and let it go at that. W.A. Dwiggins wrote this in 1939 for Publishers’ Weekly as part of a follow-up to his famous essay Extracts from An Investigation into the Physical Properties of Books as They Are at Present Published (Boston: Society of Calligraphers, 1919). As a thinly veiled reference to Knopf it has intrigued cultural historians, especially Megan L. Benton, author of Beauty and the Book (2000). But it is not a wholly accurate picture of Dwiggins’ views on colophons. This book is set in the eleven point size of Linotype Baskerville ‘opened up’ between lines with three points of blank space. The ‘running title’ at the top is set in small capitals of the body type, and the page number is in Caslon numerals spaced apart. The distances, from the top of the paper to the running title, between this title and the parallelogram of type, are all parts of the design. The manipulation of these details aims to provide a cool, quiet type-page, undisturbed by the ‘fittings’ (page numbers, etc.) without tricks or eccentricities—easily read. A little sense of the perspective of time belongs to a text of this kind. The ornaments try to provide this feeling. Notice that they are drawn to harmonize with the texture of the type page. The binding is ornament, purely—no attempt to suggest any other feeling than Now, 1934. The book was set up, printed, and bound by The Plimpton Press, Norwood, Massachusetts. The paper was made by S.D. Warren Co., Boston. Colophon for The Longest Years by Sigrid Undset (New York: Alfred A. Knopf, Inc., 1935). Once Dwiggins had boiled down the description of a typeface to his liking, it was used over and over again (occasionally with some further tweaks) for future Knopf books designed by him as well as by others. In this manner the loquacious Denman texts began to disappear from Knopf books in the 1940s and were entirely gone a decade later. Dwiggins also did away with shaped colophons. Colophon for Poems 1920–1945 by David Morton (New York: Alfred A. Knopf, Inc., 1945). 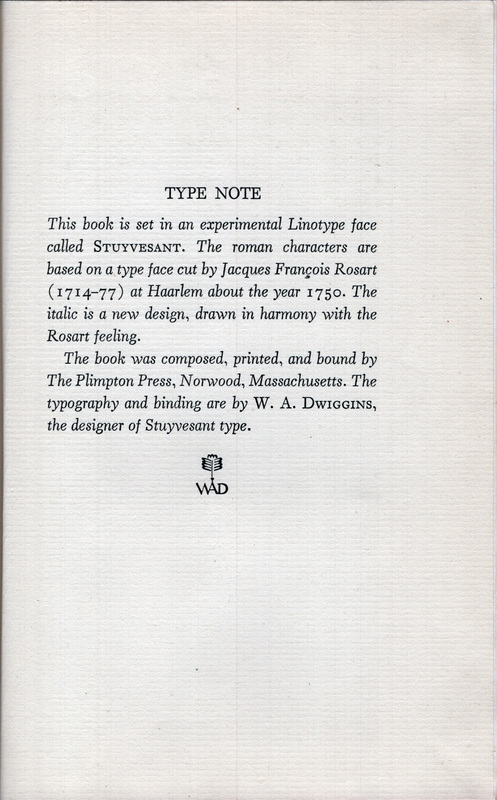 In the 1940s some colophons began to be headed “Printer’s Note” and others “A Note on the Type,” “Type Note,” or simply “The Type.” There is no discernible difference among the texts, suggesting that Dwiggins was testing out different formulations as the content shifted from being about the design of book to the typeface employed. In the end the windy and awkward “A Note on the Type in Which This Book Is Set” won out. It is still used in Knopf books today. Colophon for The Westward Crossings by Jeannette Mirsky (New York: Alfred A. Knopf, Inc., 1946). James Hendrickson replaced Sidney R. Jacobs as the in-house designer at Knopf while Jacobs was in the army during World War II. Colophon for The Necessary Angel by Wallace Stevens (New York: Alfred A. Knopf, Inc., 1951). Colophon for The American Scene: A Reader by H.L. Mencken (New York: Alfred A. Knopf, Inc., 1965). For Knopf and for Dwiggins the colophon served multiple roles. For those studying the work of Dwiggins, it does the same thing, offering up insights into his views on book design, choices in typefaces, the intertwined nature of his careers as a book designer and type designer, and the centrality of his work in establishing and refining Knopf’s aura as a quality trade book publisher. 1. I am using the term colophon in its traditional sense to refer to a note, usually in the back of a book, that describes aspects of its production: the materials used (typeface, paper, binding cloth, etc. ); the individuals and/or companies involved (designers, typographers, craftsmen, and suppliers); the number of copies printed; and the completion date. However, in recent decades, writers about Alfred A. Knopf, Inc. often use the term to refer to the borzoi, the Russian wolfhound that serves as the publisher’s visual identity. The borzoi, despite its over sixty incarnations (the largest number of them by Dwiggins), is more properly akin to a trademark or logo. 2. The physical appearance of April Twilight was under discussion in late 1922. See the historical essay by Susan J. Rosowski and Kari A. Ronning in A Lost Lady: Scholarly Edition by Willa Cather (Lincoln: University of Nebraska Press, 1997), p. 311. 3. Colophons appear to be present in A Lost Lady (1923) and The Professor’s House (1925) by Cather, although I have not seen a first printing of either book, a word search in the online Hathitrust version of both turns up key words from the colophons (e.g. “Plimpton Press,” but specifically “William Caslon”) with an indication they are on a page at the back of the books rather than on the copyright page. This suggests that the production note was augmented by the addition of the identification of the typeface and moved to the back of the book. But the phrase, “A Note on the Type in Which This Book Is Set” does not appear in either book, though it does in later printings (1958 for A Lost Lady and 1942 for The Professor’s House). In both books, as in the 1950 printing of One of Ours, the note is coupled with the older production blurb. Apparently, “A Note on the Type in Which This Book Is Set” was retroactively added to Cather’s books when they were either revised or their copyright renewed. For the ninth printing of The Professor’s House (1942) see the explanatory notes by James Woodress and Kari A. Ronning in The Professor’s House: Scholarly Editionby Willa Cather (Lincoln: University of Nebraska Press, 2002), p. 426. 4. Fifty Years: A Collection of Novels, Novellas, Tales, Dramas, Poetry and Reportage and Essays edited by Clifton Fadiman (New York: Alfred A. Knopf, Inc., 1965), p. xv. This book is composed (on the linotype) in Scotch. There is a divergence of opinion regarding the exact origin of this face, some authorities holding that it was first cut by Alexander Wilson & Son, of Glasgow, in 1837; others trace it back to a modernized Caslon old style brought out by Mrs. Henry Caslon in 1796 to meet the demand for modern faces resulting from the popularity of the Bodoni types. Whatever its origin, it is certain that the face was widely used in Scotland, where it was called Modern Roman, and since its introduction into America has been known as Scotch. The essential characteristics of the Scotch face are its sturdy capitals, its full rounded lower case, the graceful fillet of its serifs, and the general effect of crispness. 6. Frank Denman to Alfred A. Knopf, 4 April 1952. University of Texas, Harry Ransom Humanities Research Center, Alfred A. Knopf, Inc. Archives, Box 147, Folder 10. Robert Josephy (1903–1993) was a nephew of Knopf. He joined the firm in 1920 as an office boy and “after a few years” was promoted to production manager. He left Knopf at age 21 to become a freelance book designer—the first in the industry he claimed. This chronology suggests that Denman either misremembers Josephy’s role in the development of the typographic colophon or the year in which it occurred. For Josephy’s life see Taking Part: A Twentieth Century Life by Robert Josephy (Des Moines, Iowa: University of Iowa Press, 1993). 7. 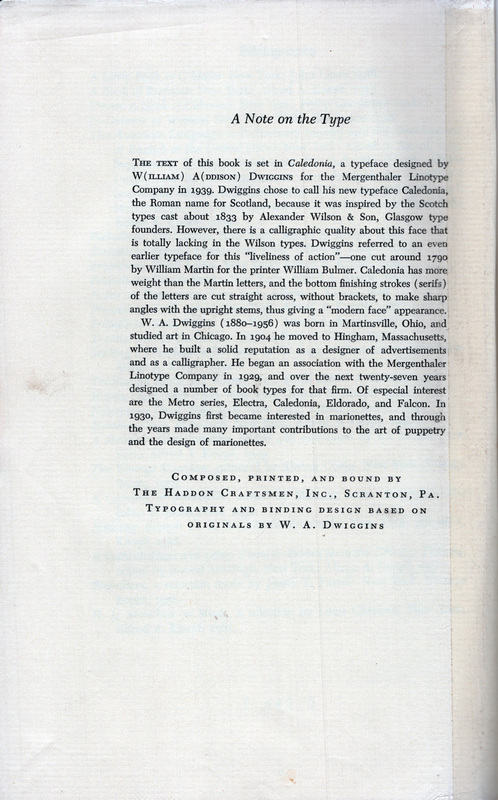 The colophon says that the typography of the text and the binding labels “are based on designs by W.A. Dwiggins” but this is contradicted by correspondence between Dwiggins and Knopf. See especially Alfred A. Knopf to W.A. Dwiggins 25 March 1927 and Dwiggins to Knopf 8 November 1927. University of Texas, Harry Ransom Humanities Research Center, Alfred A. Knopf, Inc. Archives, Box 731, Folder 12. 8. For more on the use of colophons as a marker of quality see Megan L. Benton, Beauty and the Book: Fine Editions and Cultural Distinctions in America (New Haven: Yale University Press, 2000), pp. 199–200. Although she acknowledges Knopf’s use of the colophon for his trade books, Benton’s focus is on fine books. 9. W.A. Dwiggins. “Twenty Years After” in Publishers’ Weekly (2 September 1939), pp. 797–802. Benton quotes this portion of Dwiggins’ essay—minus the portion prior to “it’s all shop talk…”—both in Beauty and the Book (New Haven: Yale University Press, 2000), p. 199 and in Illuminating Letters: Typography and Literary Interpretation, eds. Paul C. Gutjahr and Megan L. Benton (Amherst and Boston: University of Massachusetts Press, 2009), p. 1. She relied on the reprint of the text in Books and Printing: A Treasury for Typophiles edited by Paul A. Bennett (Cleveland and New York: The World Publishing Company, 1951), pp. 145–152. 10. The same text was used for the colophon for Men, Women, and Places by Sigrid Undset (New York: Alfred A. Knopf, 1939) with a slight change. “The typographic scheme is based upon a design by W.A. Dwiggins.…” was added and Dwiggins’ initials dropped. 11. 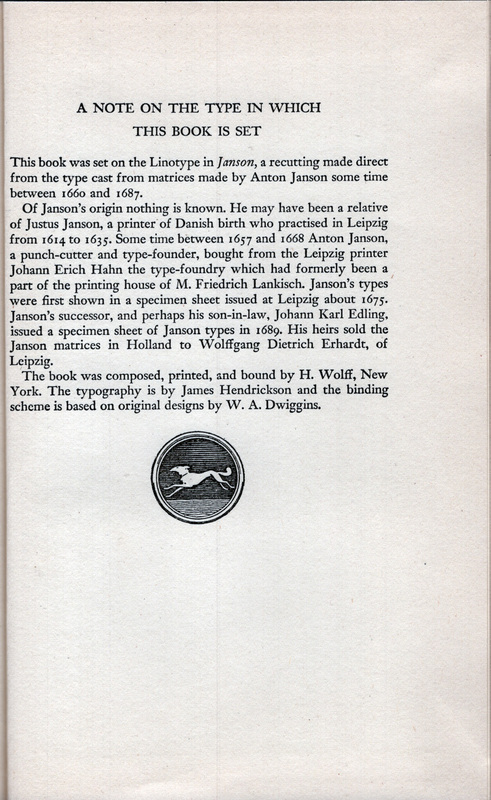 The colophon for The Longest Years was repeated in its entirety in two other Undset books that copied its format, The Faithful Wife (1937) and Images in a Mirror (1938). The typography for both was probably done by Sidney A. Jacobs, the production manager at Knopf, with Dwiggins’ acquiescence. 12. Stanley Morison famously said that, “The history of printing is in large measure the history of the title page.” His books bore out that contention. See A brief Survey of Printing: History and Practice by Stanley Morison and Holbrook Jackson (New York: Alfred A. Knopf, 1923), Four Centuries of Fine Printing by Stanley Morison (London: Ernest Benn, 1924) and The Typographic Book 1450–1935 by Stanley Morison and Kenneth Day (London: Ernest Benn, 1963). Morison’s attitude underlies much of the writing on fine printing. 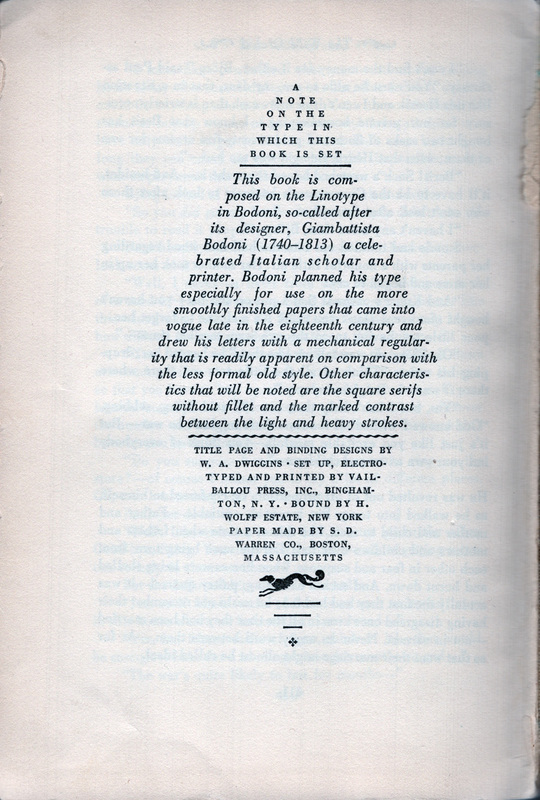 Books on Giambattista Bodoni, William Pickering, Daniel Berkeley Updike, Bruce Rogers, Frederic Warde, Jan Tschichold, Max Caflisch, Hermann Zapf, and others tend to show title pages more than ordinary pages. And, unfortunately, much of the writing on Dwiggins’ own book designs has emphasized his bindings over his interiors. I think the thing to do is to go into a huddle with the front-office and get the guts to meet wartime conditions—do things different enough to jolt the trade, and tell the trade about it. 14. The decision to create a WAD device is discussed in several letters between Alfred A. Knopf and W.A. Dwiggins in May 1945. University of Texas, Harry Ransom Humanities Research Center, Alfred A. Knopf, Inc. Archives, Box 732, Folder 5. The device was manufactured by Mergenthaler Linotype. 15. This is from The Romance of Tea by William H. Ukers (1934), designed by Sidney R. Jacobs. 16. Dwiggins’ favorite Linotype faces were, in alphabetical order, Baskerville, Bodoni, Caledonia, Caslon, Electra, Granjon, and Janson. 17. This is from An Essay for Our Times by H. Stuart Hughes (1950). 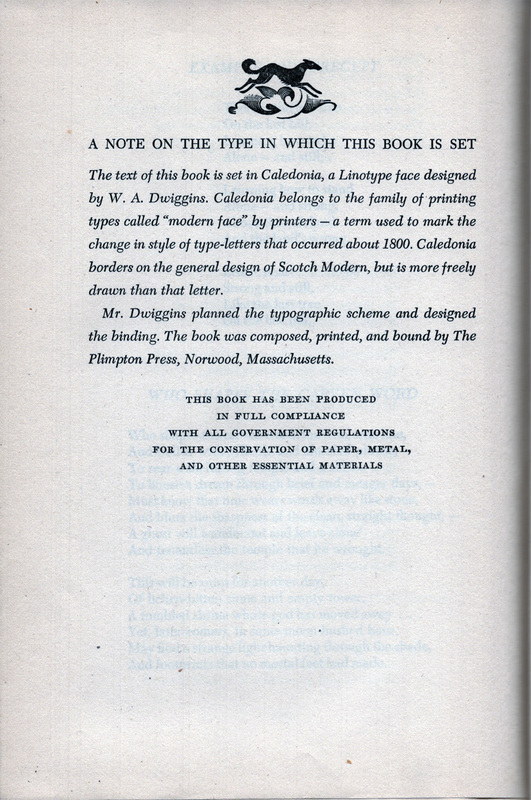 After the war, Dwiggins used Knopf books (and some designed for other publishers) to test out his typefaces. 18. The Diary of H.L. Mencken edited by Charles A. Fecher (1989). Mencken was one of the Knopf authors who insisted on having Dwiggins design his books.